Trust: it is a fragile thing. Place but a gain of doubt and the scales will tip. It's been months since Aurora arrived in Armindia. Tezaro has grown distant, Lily remains healing in Lathimnar, while Eri and Master Owen have taken upon themselves to train her into becoming the Key of Prophecy; no matter how reluctant Aurora may be to the idea of savior. But all is not well within the kingdom. Politics threaten to tear it apart if a fragile alliance is not maintained. Lord Fennaris and his sorceress Mimika use this opportunity to fan the flames of war and  chaos. Lines will be drawn and friendships will be tested. Crossings between the realms have become rare. Aurora's mysterious powers were unleashed the day she witnessed her mother's death. Years later, they have manifested again and she is being hunted. But rather than fleeing danger, she runs head on into it to save a friend. Tezaro, a legendary knight of the Kingdom of Armindia turned defector,  performed a dangerous Crossing into the Earth realm. Now he is on the hunt for the key to an ancient prophecy, but he is not the only one. Their paths collide, and to achieve their goals they will need each other. Together they will face adventure, deceit, magic, theives and warlords as they Cross into the world of Enju at odds with what they want and what fate has written. Cover Art does NOT belong to me. Do you believe in reincarnation? That souls can return to this plane of existence? Andrea is about to find out that not only is it possible, her entire family has been reincarnated several times. 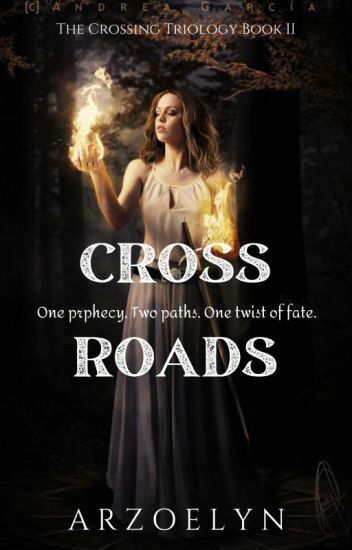 She will embark on a journey to uncover the world of the supernatural and her destiny will unfold revealing unbelievable secrets. Until a warlock comes into her life to tempt her fate and that of her family. He appeared suddenly and slowly approached me like a predatory animal lethal in his intent yet graceful as a panther. My breath escaped my body as if I was trapped in a vacuum while I was held captive by jade colored eyes. I licked my lips and swallowed, gathering my courage and trying desperately not to reveal the onslaught of attraction I felt towards him. "I, I know who you are. I've been warned about you." His mouth slightly lifted at a corner with the hint of a smile and now that he was right in front of me, I prayed to heaven he couldn't hear the erratic pounding of my heart. "What did they tell you?" His tone was mocking but his voice was sin. His eyes may have held me prisoner, but his voice made me feel like a willing victim. I couldn't look into his eyes any longer or I'd be lost. "That you are evil. That you want to destroy my family." "You have no idea, do you?" He stood more than a head taller than me and leaned down to whisper provocatively into my ear. "What I want... is you." Disclaimer: Cover Art does not belong to me. Hello! This is the third and final book in the SPIRITS' WAR series. Thank you for reading and for any feedback you may give. I really appreciate it! © 2018 by K.V. Wilson. All rights reserved. This book or any portion thereof may not be reproduced or used in any manner whatsoever without the express written permission of the author. Cover design © 2018 by K.V. Wilson; images used from Pexels and Pixabay under creative commons. ⚔️69 in adventure🐉: The fight is far from over. Scelestra may bleed; but, her empire lives on. She still lurks in the shadows plotting and twisting the innocent hearts of the Tendaarens. It is up to Alyenna to show that they can win the fight together. Yet now she has to battle against her greatest and most insurmountable foe yet, her own face. Alyenna, armed only with her sword, her spirit, and the support of a cherished few must instore the hope of a torn and shattered world. Yet each step she takes is shadowed by the failures of her ancestor. How can she be the face of a revolution when she also is the face of failure. Our heroes have only won a single battle, but they are far from winning the war. Book II of the Award-winning Tendaaren Chronicles. Please read book one first. If you have read book one, then by all means continue! Best ranking to date #168 in the adventure category! I live among humans, hiding my secret in plain sight. Except the Goblin King has found me and seeks to kill me for my powers. My time is running short and the only thing that can save me is harder to find than swimming up a mountain. My friends call me Ella, and I am a shooting star. You mess with one of the Three, you mess with them all. The Battle of the Ritual may be over, but the war against the Covenant has only just begun. Skye and her companions head to Canada in search of more recruits and for Sejka's long-lost brother. Meanwhile, Mac Tíre, Ace and Greg remain in the U.K. to seek an old ally: the great dragon Nwyfre. But when the Lìog Airgid's worst enemy, Patercius, resurfaces to join forces with the Covenant, the Three must rely on fleeting memories from past lives to take down their enemies new and old. Hello! This is the second book in the SPIRITS' WAR series. Thank you for reading and for any feedback you may give. I really appreciate it! © 2017 by K.V. Wilson. All rights reserved. This book or any portion thereof may not be reproduced or used in any manner whatsoever without the express written permission of the author. Cover design © 2017 by K.V. Wilson; images used from Pexels and Pixabay under creative commons. She never knew she was anything other than human. He knew what she was and would take his revenge the moment she returned. Everyone knows how fairy tales are supposed to go. A young teenage girl finds out she's a princess, meets her prince and lives happily ever after. Not in this twist. An Elven prince is sent on a mission to hunt down the lost Siri princess and kill her. Find out how sixteen-year-old Corinne Blakely finds herself fighting for her life and love in a new, magical world ruled by Queens.